eBird just posted on their site yesterday using the example of Cedar Waxwings, encouraging its users to look at this same kind of data, be it maps or graphs. eBird-user curiosity may help discover and explain things about bird behavior. My first ever Lazuli Bunting was in Patagonia, southeastern AZ, specifically in Marion Paton's backyard on March 18th, 2006. It was not in breeding plummage and therefore was a bit of a let-down because I was so excited to see one as portrayed in my field guide. Now, where I live in the foothills north of Boise, Idaho I have them breeding and nesting in my community, but I don't take them for granted. I love them every time I see them! Here is a month-by-month map showing the Lazuli Bunting migration. Looks like wintering grounds mostly in Mexico, but some in Southeastern Arizona. Lazuli Buntings have very similar patterns to Western Tanagers and Bullock's Orioles. In fact, the Bullock's Orioles and the Lazuli Buntings have almost identical ranges. The Western Tanagers do seem to make it much further north into Canada than the other two species. Please continue to submit your bird sighting checklists to eBird. It's really cool, interesting, and important! My husband and I have lived in Cottonwood Heights for over 20 years and have never seen the beautiful,Lazuli Bunting's at our feeders until this year!The first time we noticed them was over a week ago and they are still here. 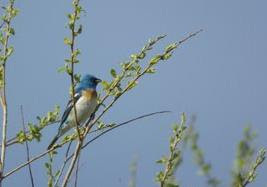 We have seen 7-8 lingering at the feeders at one time and more of them in our trees surrounding our ponds! I hope they stay and nest! It took me a while to figure out the name of this bird since I have never seen them before either. I live in Orem, Ut. and have seen a big group of them hanging around my bird feeder for the past week. I hope to see them every year!